I just wanted to do a quick outfit of the day for you today! The picture is pretty crappy, I know, but I absolutely loved this outfit and mirror selfies were the only pictures that I had! But that's okay, right? I wore a basic white cami. Not very interesting, but I thought that it might get warm later in the day, so I wanted to wear a tank top. Then over it I added a cardigan that is cream and red. This was my "red" piece because since it's valentines day, you must have something red in you're outfit! 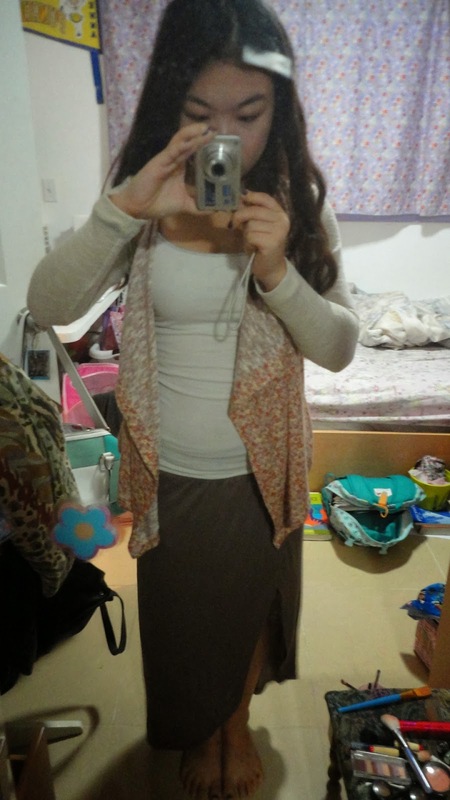 I really love this cardigan thing and it's probably one of my more worn items! This skirt was from a boutique! You might have seen it in a recent haul that I did (I'll link it here)! Its just a tan maxi skirt with a very high slit. I think that you're supposed to wear it with the slit in front, but that seemed like a wardrobe malfunction waiting to happen so I wore it with the slit on the side. The slit also went all the way to the top (with a mini skirt length liner underneath) but the liner kept riding up when I was walking so I safety pinned it so the opening was a little lower. I don't really know if this made sense or not, but I hope it did! I didn't wear any jewelry with this, but I did a really pretty gold/copper makeup look that will be in a makeup of the day post soon! I am pre-writing this so I don't know the exact order of the posts, but the makeup of the day one should either be the one directly before this or the one right after it if that helps! I hope you enjoyed this post! I'll try to do more outfit of the day posts because I love them and I think they are so fun to write! Let me know in the comments what you wore for Valentine's day!